The "Mom on the Go" planner is non-denominational and designed for Christian moms. It includes the same home and family section with kid trackers, chore charts, family goals, budget sheets, monthly and weekly spreads, etc. The "Simple Planner" is the same as the Mom on the Go planner, but withOUT the home and family section in the back. The "Know it, Live it, Love it" planner is specifically for LDS single adults/students, for those who either have not started their family yet, or are now empty nesters. 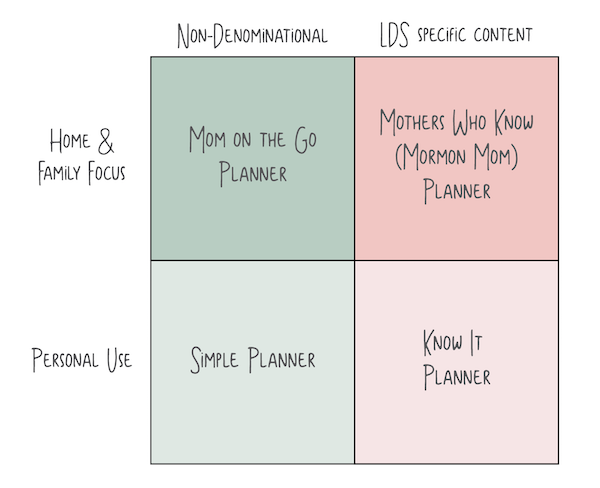 It is the same as the Mormon Mom Planner, but withOUT the Family Home Evening pages and the home and family section in the back. This planner is only available in the yearly format (January through December).